When the temperature rises during the summer months, a malfunctioning or inefficient portable air conditioner can be a serious concern. Not only would you be uncomfortable in a hot and humid setting, but you may also have to bear a higher electricity bill. When a portable AC unit is not functioning properly, it is almost certainly drawing more power to make up for its inefficiency. Unless your air conditioner has stopped working completely and it is not a result of a power failure or electrical connection problem, you don’t always have to call a technician to get it fixed. There are common portable air conditioner problems and solutions that can be attended to and completely remedied without any help from a specialist. 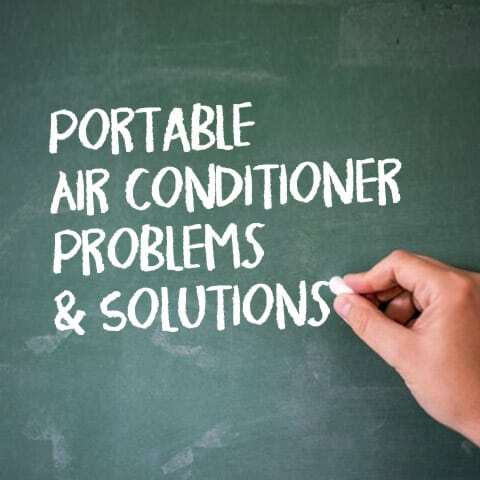 Here is a comprehensive portable air conditioner troubleshooting guide that sheds light on the most common issues that you will come across and how to repair them at home. As you will see below, most of the common problems that you will face with a portable air conditioner can be fixed relatively quickly and easily. However, there will come a time when your device has reached the end of its life or costs too much money to have repaired by a professional. If that is the case, then you should probably replace the appliance with a new one. Take a look at our free guide on portable air conditioners. This page shows you what features to consider and how to find the best one for any size room. We also have another guide with cheap portable air conditioner reviews for those of you who are budget conscious. Have you turned on the portable AC unit will not start? This could be due to lack of power. If every other appliance or the lights in the room are working, then you should check the specific power outlet of the air conditioner. Check if the socket has power, check the cord to see if it is damaged, check the circuit breaker to see if it is functioning properly, reset the circuit or use another outlet to see if the appliance starts. If there is no problem in any of those components then there is something wrong with the portable air conditioner, which can be as simple as a blown internal fuse. Consult the manual to see if you have access to the fuses. If not, this task is better left for a professional since the entire appliance will have to be opened up to replace a fuse. A portable air conditioner may suddenly shut down if a timer was active. Restart it again and see if it stops again without the timer being active. Some models of portable AC units shut down when the temperature set by the user is achieved and the room is just a notch cooler than the outside or ambient temperature. When the temperature in the room rises up too or is higher than the outside or ambient temperature, the system will work again. Limited or lack of air flow can often be the result of a dirty or clogged filter. When troubleshooting this portable air conditioner problem, first clean the filter to get rid of any dust or dirt that has been trapped inside it. Use a vacuum or brush. If the filter is washable (see the owner’s manual to find out), rinse it under running water and air dry it before reinstalling. Frost build up can also limit airflow. Check for frost in the cooling or evaporator coils. Debris in the system, frost or any kind of obstruction will adversely affect airflow. Many portable air conditioners come with a defrost feature. Use this to get rid of frost. An overheated compressor may also lead to lack of airflow. Inspect the window section of the portable AC unit and the hose to see if there is adequate ventilation. Depleting refrigerant can also affect air flow. If the all of the other solutions fail to fix this problem, have a technician check for a refrigerant leak and if the compressor is on the fritz. This is another very common portable air conditioner troubleshooting issue and the solution is usually not as bad as it may seem. Similar to the last problem mentioned, to diagnose the problem of the portable AC not cooling enough, first check the filter and see if it is clogged or dirty. If it is, clean it. Then, look for any air intake obstructions and remove them. Inspect the exhaust hose and see if there is any obstruction here. An excessively long exhaust hose could also be a problem. If it is too long then it won’t vent hot air efficiently. Try to ensure that this hose is as short as possible. Check if doors or windows have been mistakenly left open and ensure the fan speed is high or at its highest. At times vents or gaps in doors and windows can let cool air escape, making it feel like the portable air conditioner is not providing enough cooling. Portable cooling systems are designed and meant to cool small to medium sized areas. Common places include a living room, bedroom, basement, a study or lounge. For that reason, portable air conditioners are often used for supplemental cooling and most often used in areas where centralized air conditioners do not cool a space inside a home or office evenly. Being small units, portable AC units can have insufficient cooling if they are used in too large of areas or rooms, if there are too many people inside a room or if there is some issue with the system. If the unit is too small for a given room and if the outside temperature is too high for the appliance, then it will struggle to cool the place to the desired extent. Make sure that you have the right sized appliance for the intended space. Details on how to find out follow. You need to calculate the square footage of a room in order to get the right size for an air conditioning unit, unless the ceiling height is unusual, in which case you need to factor in the cubic footage or volume of the room. To do this, measure the length and width of the room, then multiply the two numbers to get the square footage. Match this number up to the appropriate British Thermal Unit (BTU) in the chart below to find the right size portable air conditioner for the space. For example, a 10′ x 40′ room would equal 450 sq. ft. (10×40=450). The chart below indicates that a 9,000 or 10,000 BTU portable air conditioner would be ideal for this location. When it is too hot outside, a portable air conditioner will struggle to cool a room quickly or be able to attain low temperatures. If this is the case, then ambient temperature adjustment is necessary. The set temperature for a portable AC unit should not be more than ten degrees below the outside temperature. Always go for room temperature when in doubt. Ensure your rooms are well insulated. Look for leaks or gaps. Even a small opening in a door or window can cause the unit to draw in warm air from other rooms and limit its cooling capacity. If a room is exposed to direct sunlight, this can be very problematic for the portable air conditioner to compensate. The best options are to install blinds or double glazed glass for windows and doors to prevent the room from getting too overheated. A musty smell is one of the easiest portable air conditioner problems and solutions to fix. This odor often indicates the growth of mold or mildew. When an air conditioner retains water, mold spores find it to be an ideal breeding ground. If you get rid of it, the smell will go away. Inspect the drain pan and drain line, evaporator coils and filter for any discolorations. If discovered, wear a mask and clean all reachable areas with a cleaner that is made specifically for mold and mildew.